Although the majority of the church structure is of the 14th century, it is, however, certain that the present square tower is a survival of an even earlier building that stood on the site. Although the earlier building no doubt had a timber bell-turret at the West end, in the 12th or 13th centuries a new tower was built to house the bells and was attached to the rest of the church, which was in turn renewed a century later. Today, the lowest storey of the bell tower, which is used as the Vestry, is probably the oldest part of the church. In the 15th century the tower was re‑cased and battlements and timber spire, which was restored in 1961, were added. The tower clock is inscribed: ‘Be diligent, Night cometh’. The clock is an interesting one having a slate face, the numerals are incised and gilded with gold leaf. By the 1960s, one account says that the bells were sounded by a rope tied to the end of a clapper which was pulled direct to the bell; a practice known as clocking and not recommended. 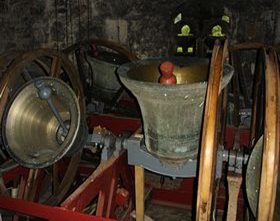 The bells were badly out of tune, the clappers suspended from iron staples cast and embedded in the metal of each bell putting them in danger of corrosion. The tenor bell on which the clock strikes, was being damaged to such an extent that a hole was forming where it was being struck by a sharply pointed hammer. Of the bell fittings, to quote the report: “They are old and unfit for further service; the headstocks are grubby and splitting, the securing ironwork is weak with corrosion; the wheels falling to pieces; the clappers are crude, ill‑shaped lumps of iron and the gudgeons and bearings are badly worn”. Add to this that the very old oak frame was quite unsuitable to support the thrust of the bells in full swing and was carried on a floor which was supported by three equally old beams propped up by vertical timbers from the clock chamber beneath, all of which was thought unsound. The PCC at the time had the forethought to include room within the new frame for two more bells ‘just in case a future generation should wish to add more bells’. 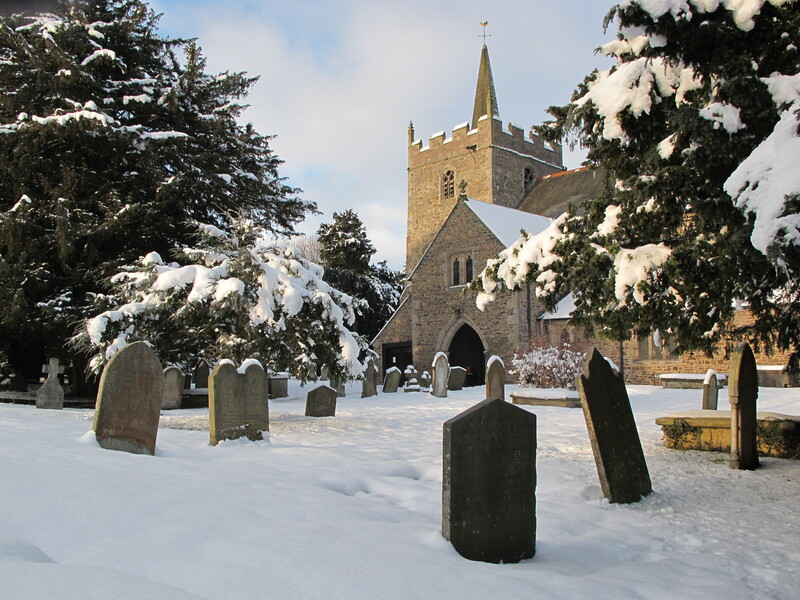 We are now very proud to have a fine ring of six bells in excellent condition and more details of bell ringing at St Aelhaiarns can be found here.